Evidence has accumulated documenting loss aversion for monetary and, recently, for health outcomes—meaning that, generally, losses carry more weight than equally sized gains. In the conventional Quality-Adjusted Life Year (QALY) models, which comprise utility for quality and length of life, loss aversion is not taken into account. When measuring elements of the QALY model, commonly, the (implicit) assumption is that utility for length and quality of life are independent. 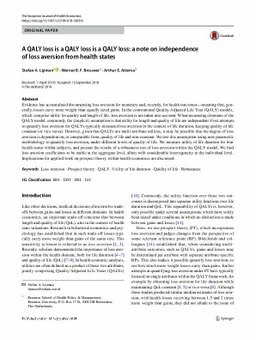 First attempts to quantify loss aversion for QALYs typically measured loss aversion in the context of life duration, keeping quality of life constant (or vice versa). However, given that QALYs are multi-attribute utilities, it may be possible that the degree of loss aversion is dependent on, or inseparable from, quality of life and non-constant. We test this assumption using non-parametric methodology to quantify loss aversion, under different levels of quality of life. We measure utility of life duration for four health states within subjects, and present the results of a robustness test of loss aversion within the QALY model. We find loss aversion coefficients to be stable at the aggregate level, albeit with considerable heterogeneity at the individual level. Implications for applied work on prospect theory within health economics are discussed.